I Just Want to Be Noticed! Is it Really That Difficult? Does it seem like the pool of aggressive, talented authors increases by the day, and the need for quality content has never been greater? Today, the most successful authors go to extraordinary lengths to gain more readers and outlast the competition. Endless new marketing tactics and strategies are being attempted at a steady pace, with authors hoping something will stick with audiences. If there are so many ways to get noticed in your niche, is it really that hard to be unique? Take a moment to read our top 10 ways you can stand out as an Expert Author. 1. Build Your Story: When your readers wonder who you are, it should be easy to find. Improve your credibility right away by ensuring you’re not a “mystery person” writing articles. Your profile, author photo, areas of expertise, goals and past achievements should be clear for everyone to see. It is also important to have an active presence on relevant social media and include an ‘About’ section on your website. 2. Focus on Your Strengths: Many authors have expertise in multiple fields. While this can be beneficial in the long run, when you’re trying to get noticed starting out, you need to focus on your strengths and master your craft. Think about applying for a technical job. You will have a much better chance at landing the job if you’re an “expert” in one area than if you’re “pretty good” in everything. Stick to what you’re good at and build from there. 3. Getting the Essentials Right: There are essentials everyone must get right in order to achieve success. First, stop focusing on the traffic and instead think about creating a connection with the reader. When writing your articles, you should answer three important pieces of information: why, how, and what. Don’t simply tell your readers what to do, how to do it, and why; create value and purpose. Refer to this blog for more tips on Getting Read: Essentials to Making Your Article Worth It. 4. Act Like a Professional: Some authors try their hardest to get ahead even if it means hurting their credibility. Your personality, attitude and ability to communicate professionally should be at the top of your list to improve. Think about your decisions before you go all-in on your next step, and put yourself in your readers’ shoes to get a clear perspective. You don’t want to turn them off by acting like an amateur. 5. Find Your Voice and Shout: Ok, we’re not encouraging you to scream at your audience here. However, you do need to break out of your shell and learn to be vocal about your writing. You want to be the life of the party with great ideas who gets all the attention, rather than the quiet one in the back of the room. Share your ideas and aspirations with your readers. They want to hear them! 6. Perfect Your Timing: Time management is a skill that takes, well, time to master. What’s more important than using your time wisely is to introduce new articles and products when the time is right. You need to research when your readers are in-tune the most, and when you should pounce on the opportunity to connect with them. Click here for a unique perspective on reaching your audience at the opportune time. 7. User-Friendly “Everything”: This is one of the easiest tips to remember: make every part of your business user-friendly! Whether it’s developing a website, creating a series of articles or asking for feedback on social media sites, your readers should be able to understand and follow everything they see. You don’t want to stand out in a negative way by turning away potential customers! Making things user-friendly for them should be a priority. 8. Embrace Change with Confidence: Oftentimes authors get so comfortable with their routine, they forget that things can change that may negatively affect their work. It’s important to embrace change, as it can come from any direction at any time. Show your readers you are on top of your game by quickly adapting to diversity, and that you already had a plan in place to move forward. Don’t let unexpected changes destroy your progress! 9. Praise Your Competition: There is definitely competition as an author, especially in today’s ever-changing, global marketplace. Have you ever thought about scoping out the competition and giving others in your field praise? This is a strategy that is useful on social media. When you take the time to give your competition respect, you will only receive positive feedback from your audience. You might even hear from your competition and end up working together on a project! 10. Thank Your Readers: If you truly want to stand out in your niche, every now and then you should offer something to your readers for free and thank them for being a part of your journey. Provide an easy-to-package product that they can use, or a special promotion to your loyal followers. If you need some ideas with this, here are 7 Ways to Give Thanks as an Article Writer that can be used right away. So there you have it! Our list above can be summed up in one phrase: Keep it simple. When you over-complicate your efforts to stand out among the jam-packed crowd of writers, it will only lead to frustration and backtracking. Refer back to these tips when you’re feeling like nobody is noticing your hard work. If you’re looking for some added inspiration to boost your confidence as a writer, get back on track and build confidence in your writing with this blog. Another great listing of tips. Thanks Courtney. “Act Like a Professional” I think this the most important element for a qualified writer online. Good tips. Some html will be used for it. Praising the readers and understanding “What they wanted to read” is the primary thing and yeah, User friendly content on perfect time is the remarkable thing for authors! anyway, nice guide for authors. Great Tips, will really help me a lot! Thanks, Courtney.. Thanks for taking the time to make and sharing such a great post! Your website is way too good, It contains wonderful and helpful posts, I found it is perfect for my needs. I will keep coming back for more great post like this one. Please keep it up! Awesome Article! There were a few tips in there that I had never considered but now Your suggestions inspire me to make some changes. Very helpful tips for all types of bloggers. All of our blogs are written by the staff at EzineArticles.com. You’ll notice the “Posted by” name has changed over the years. When applicable, we’ll consider adding the names of team members who helped contribute for each of the blog entries. Thanks for your feedback! Good information. Tips to be noted down. Inspiring article from your end. I am completely new to this. I have ideas & words in my head and I am trying to find a good way to express myself. I found this article very helpful. I will use this. Gracias! Great tips. #1 is my priority. I think trust is the most important thing we should focus on. I believe we should be transparent in all activity before we ask for trust from others. I’m applying this point on my whole business. It works. This is a really useful article. I am completley new to this and your information and advice is really inspiring. Having a personal story and clear motivation for everything is key. It is what stands us out from each other. This is what my blogs and articles will need to communicate. Thanks for sharing. There are lot of thins to know; I will certainly work on it. Wow. That’s more than a gesture. I received a purse once (not writer related) and a temporary employer gave me a beach blanket. You’re right. I felt more loyal to both. I learnt sets of new strategies to apply in my Writing techniques from this, thanks for the great article :) I’ll be here again for more! Very good article; it was the booster shot I needed! 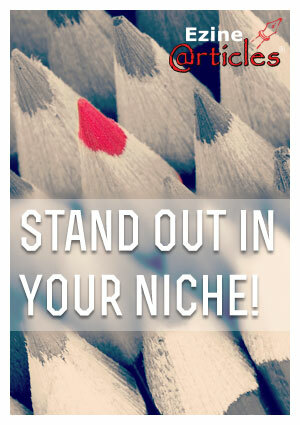 As a contributor to einearticles the 10 suggestions of how to stand out in a niche caught my attention. Writers at every level today face so many “rules” as to what makes a good writer, article, blog, etc, that many end up not writing at all. It seems there needs to be more encouragement to just write. New writers will get the message at EzineArticles pretty quick when their pieces are put on hold or not accepted, with reasons that will lead to improvement. Chances are there will be some feedback suggesting this article is for seasoned writers. The amateurs are just as likely to read it and fail to connect with what “professional” or “user friendly” mean. There are links out for some suggestions. Maybe links to clearly define each of those 10 suggestions in layman’s terms could be a good idea. Just a thought. Overall one never has enough reminders about what it takes. Thanks for your efforts to jog our memories. Excellent information about the fundamentals of standing out in your niche. Keeping it simple and providing quality content wins every time. It’s a wonderful service you provide to all of us with your blog. Thank you Courtney, for the article writing tips! I believe your suggestions will be very helpful.